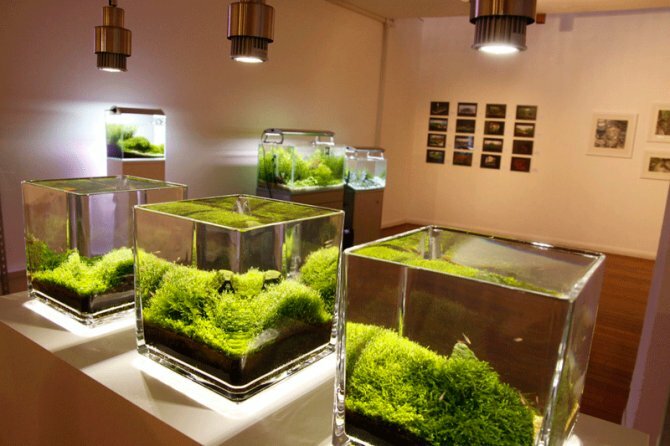 PFK reported that live aquascapes were to be featured in an art gallery earlier this month. "I am very pleased to say that the exhibition, held in a London art gallery, was a success," says George Farmer. With an estimated 2,000 visitors over course of the exhibition, aquascaping was brought to the attention of a whole new audience, many of whom had never seen anything like it before. Given the opportunity to present our work in this way was a great honour and privilege. Visitors included a wide range of representatives, from the art world to the curator of London Aquarium and representatives from London Zoo. Lots of PFK readers also made it along, which was great to see, with some travelling hundreds of miles. Many stood transfixed in front the tanks for quite some time. Graeme Edwards’ concept piece with a log seemingly running through the side of the glass received a lot of attention. Most had to take a closer inspection too see how it was done. James Starr-Marshall’s triptych was regarded by many as the strongest piece, with my own Iwagumi (featured in the Christmas issue of PFK magazine) seemingly making a big impression. There will be a full report, including high quality photos from the event, in a forthcoming issue of Practical Fishkeeping magazine.